I am almost complete in upgrading from Ogre 1.9 to Ogre 1.11.2, but I have yet again ran into a problem. Shadow receiver materials are behaving strange when using hardware animation, when not using hardware animation, it works perfectly. For some reason, when I use the exact same shader/material for hardware animation on Ogre 1.9, it works. The shadow casting work either way, it is only the shadow receiver that does not work properly. Below is a very simple shader/material that works on Ogre 1.9 but not in Ogre 1.11.2. I have tried everything I could think of, but nothing fixed it. I tried changing "worldMatrix" to many other types of "param_named_auto", but nothing works correctly. Last edited by rpgplayerrobin on Sun Jul 15, 2018 4:05 pm, edited 1 time in total. probably the aabb of the object is wrong/ out of date with hardware animation as the data is on the GPU only. Try enabling shadowBuffers for that mesh. Also compare Mesh::_computeBoneBoundingRadius with and without hardware animations. It seems that "mVertexBufferShadowBuffer" and "mIndexBufferShadowBuffer" are actually true from startup on that mesh, for both with or without GPU animation. Mesh::_computeBoneBoundingRadius calculates "mBoneBoundingRadius" to the same value for both with or without GPU animation: 0.149066687. Making the AABB visible shows me that they are correct for both with or without GPU animation (since their scene nodes still actually change position/orientation, and that the entity still has a base AABB). I would think this has something to do with shaders, since the shadow texture is actually added to the shader but is just visually incorrect. Why would my GPU animated meshes become fully shadowed when I move my camera into a shadowed area? Keep in mind that this worked on Ogre 1.9, so it is not a general error, probably just Ogre 1.11.2 error. hmm.. there are many changes between 1.9 and 1.11 - notably the 1.10 release. Which ShadowCameraSetup are you using? Ideally I would need a minimal reproducer scene to investigate.. Thank you so much to be willing to investigate! Search for "tmpMediaDirectory" in Main.cpp and make sure it is to the path of the local resources I uploaded above. Which ShadowCameraSetup are you using? I am using the default one, I never set it anywhere in my code. thanks for then reproducer. it will take me a few days until i can give it a spin though as i am away over the weekend. one thing i noticed is that you use camera relative rendering. have you already tried disabling that? Yeah, setting it to "false" still does not solve it. 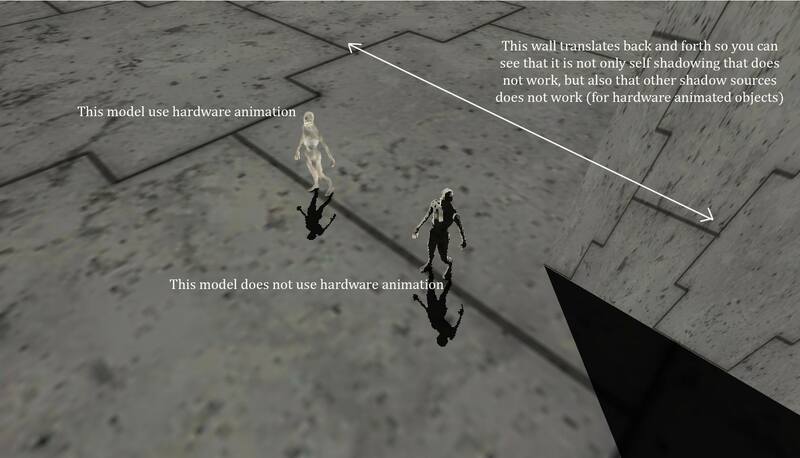 Though it does change the appearance of the shadow by a bit, the hardware animated objects get fully shadowed if the origo of the scene (0,0,0) is shadowed. They either get fully shadowed or not shadowed at all when this happens. This relative rendering setting explains why the hardware animated objects become shadowed when the camera is in a shadowed area, but still does not change the bug. No worries if it takes a couple of days, I am just glad to get some help! I finally managed to get a hlsl debugger working properly, and I think I see the bug now. As I am using "float3x4 worldMatrix3x4Array;" AND "float4x4 worldMatrix;" it all goes wrong in the core. See the function "SceneManager::setWorldTransform", there is populates the world matrices. If it has hardware animation enabled when it goes into "SubEntity::getWorldTransforms", it gets all those bones as float3x4 matrices. If it does not use hardware animation, it gets the world matrix as a float4x4. Then in "GpuProgramParameters::_updateAutoParams" it gets the cached (non-dirty) matrices as float3x4, which is correct for bones (world_matrix_array_3x4 aka ACT_WORLD_MATRIX_ARRAY_3x4). But this also means that the world matrix (world_matrix aka ACT_WORLD_MATRIX) gets its value as a float3x4, as it uses that cached versions first index (as seen in AutoParamDataSource::getWorldMatrix). Then I use that world matrix to calculate the shadow uv, which gets messed up completely. I now understand the bug completely, but I am not sure how to fix it in an elegant and optimized manner. What is your input on this? Should we fix it in the code or should I just use this shader "hack"? The bug was introduced in 1.11 with the switch to the Affine3 class. It works now without the shader hack.